ETG is the leading retail company in Latvia. ETG operates department store Podium and podium.lv website. Our annual sales reached 80 million dollars in 2013. Always staying one step ahead of the competitors ETG offers not only the vast variety of products, but also new standards in service. Customer satisfaction stands in core of company successful 25 year business experience. The principles we are following from the opening day are - broad range of high quality premium branded merchandise offered at competitive prices, increasing exclusive offers and our commitment to provide an imaginative, exciting and relevant shopping experience to our customers. 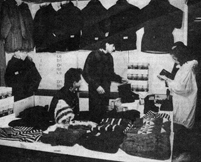 In 1989, a 21- year- old Alexander Popov started to produce and sell clothes. 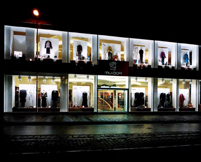 Fashion store Podium was opened in the City centre of Riga on Kr.Barona Street. 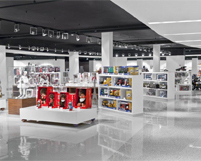 Second floor of Podium store was introduced to customers. 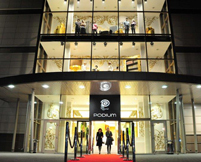 New luxury flagship department store Podium was opened on Brivibas street. Five floor building with 110’000 square feet become the largest and most attractive top fashion orientated shopping place in the Baltics states. 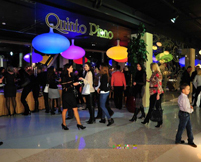 Restaurant Quinto Piano was opened on the department store fifth floor. Delicious menu and beautiful city view attracts city visitors and Podium customers. 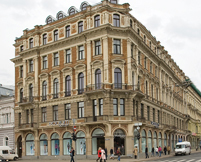 Podium Outlet was opened in Riga historical City centre. Podium Kids concept was opened. The whole floor (20’000 sq ft) was dedicated to our smallest and more demanding customers – kids. Baby products, toys and kids fashion clothes houses on the department stores fourth floor. In May 2012 Podium hosts Latvian and Georgian entrepreneurs meeting in collaboration with Forbes. 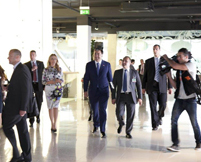 The main guest of the event was Mikheil Saakashvili, President of the Republic of Georgia. Redesign and improvements took place in the department store in 2013. In 2016 luxury fashion center "PODIUM" begins a new stage of life - a new home in the heart of the city - Brivibas Boulevard 21. 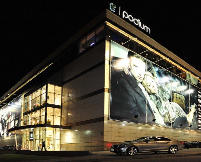 On "PODIUM" two floors are shown more than 20 world-famous fashion brands such as Salvatore Ferragamo, Armani Collezioni, Moncler, Philipp Plein, CORNELIANI, Paul & Shark, Michael Kors, Burberry and many others.